Starting a website is easier than ever in 2019. You have a lot of platforms to choose from, and many enable you to create almost any type of site you want. However, choosing which Content Management System (CMS) to use has never been more challenging, due to the sheer number of options available. If you’re eager to try any of them, Hostinger offers web hosting plans with effortless 1-click setup and 24/7 live support. And when we’re done, you’ll know how to pick the best CMS for your website! CMSs provide you with an easy and flexible way to build websites and publish new content. A Content Management System (CMS) is an application that enables you to publish and manage content on the web in an intuitive fashion. For example, imagine that you had a text editor (like Notepad or TextEdit) that enabled you to publish articles directly to a website you own. That would be a very basic example of a CMS. Of course, these days most of the best CMS options help you do a lot more than that. They enable you to index your content, make changes to it, format it using visual editors, and more. It’s easy to confuse a CMS with a website builder. The latter is a kind of tool focused on helping you create websites without any coding knowledge. Usually, they accomplish this by providing you with access to a visual drag-and-drop editor. However, they tend to be a lot simpler, offering few customization options and little control over the way your site is set up. A CMS, on the other hand, used to be more difficult to pick up and use without any technical knowledge. However, nowadays the best CMS options provide you with plenty of tools to help you design and create modern websites. This type of CMS is basically a one-stop solution for creating websites and managing their content. Depending on what CMS you use, you might also get access to additional features that you can install using ‘plugins’ or ‘extensions’. However, we’ll talk more about that shortly. A lot of people think that CMSs are just for blogging. It’s true that some of the best CMS platforms were originally built with blogging in mind. However, a lot of them have evolved to the point where they’re now highly customizable. WordPress, for example, powers around 30% of the entire web. The truth is that CMSs these days are so flexible that you can use them for almost any type of project you want. However, they’re ideal for websites built around content creation and sharing. That means you can use them to create simple blogs, tutorial websites, portfolios, news sites, and more. With the right tools, you can even tackle more advanced web projects using a CMS, such as online stores, private membership sites, and forums. In a moment, we’re going to introduce you to some of the best CMS options available today. However, before that, let’s talk about what features you should look for when choosing a CMS for your website. A way to easily publish new content. Any quality CMS will include a powerful editor, and plenty of options to make sure your content looks top-notch. Content taxonomy options. The more content your website has, the more important it is to keep everything organized. That’s why a CMS should enable you to create categories, assign tags to your articles, and so on. Page editing functionality. Aside from publishing content, you’ll need to create various types of pages for your website. Your CMS should provide you with the tools you’ll need to get the job done. A high level of customizability. In our experience, the best CMS platforms are highly customizable. That means they enable you to add almost any feature you want, which in turn enables you to create more advanced websites. A strong community. CMSs with active communities are under constant development, so you’ll always have access to updates, security patches, and help from other knowledgeable people. 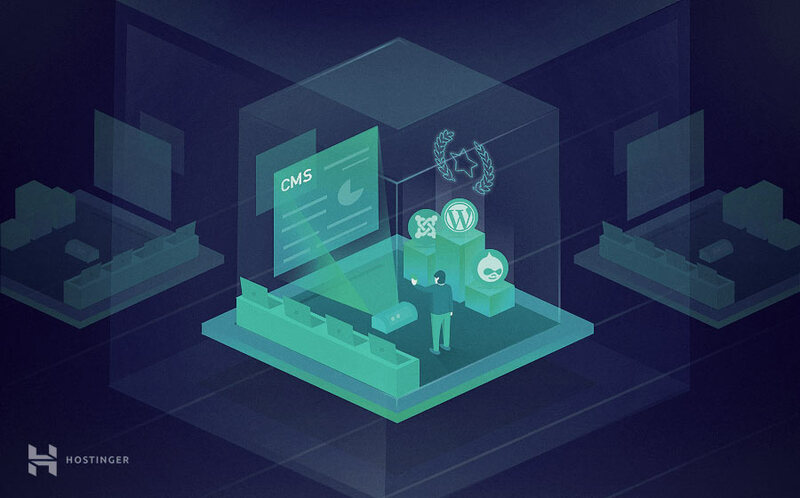 These are five core features you should expect to see in any CMS worth your time. Aside from that, most of the best CMS options vary a lot in terms of features and the types of projects they’re suited for. In the rest of this article, we’ll take a look at some of our favorite CMS platforms. We’ll discuss what makes them unique, explore their pros and cons, and help you choose the best CMS for your site. There’s a lot of variety among the CMS options we’ve handpicked for you here. However, they all have one thing in common – they’re all open source and available to install in 1-click on Hostinger! That means you won’t need to spend a dime to download and try each one out. Find the best CMS with all in one web hosting plans. We’re willing to bet that you’ve probably heard about WordPress. This CMS boasts the largest market share among its competitors by far, and it’s easy to see why. Although WordPress was conceived as a blogging platform, it’s grown far beyond that point. The platform is easy to use, and you can customize it to your heart’s content using plugins and themes (of which you have thousands to choose from). When it comes to content management, WordPress also provides a top-notch experience. Publishing new posts and pages is simple, and you have access to a powerful editor that enables you to format your content. 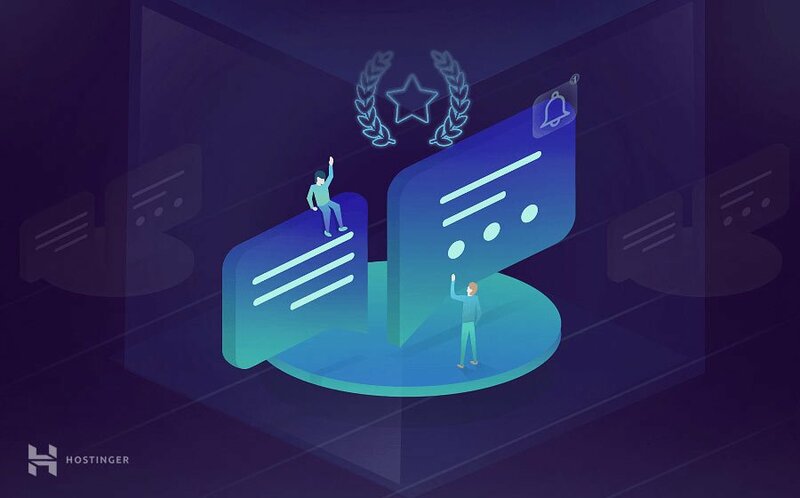 Moreover, the platform also supports user registration, gets regular updates, and features a large and helpful community. Includes intuitive publishing and content management options. Provides a powerful editor that enables you to format your content with ease. Is highly customizable, thanks to thousands of plugins and themes. Has a strong and vibrant community. The only downside to using WordPress is that sometimes you’ll need to mix and match a lot of plugins to add the precise functionality you need to your site. There are also other CMS options that provide a more streamlined blogging experience, although they can’t match WordPress’ customizability. When people debate which is the best CMS software, Joomla is one of the names that comes up most often alongside WordPress. The general consensus is that while Joomla may not be as beginner-friendly as WordPress, it can be more flexible in some aspects. For example, Joomla is a great option if you need to manage a lot of ‘custom post types’. That is to say, it’s ideal if you want to run a website that isn’t largely based on text content. The platform also offers a lot more options when it comes to user management. This makes it a fantastic option for membership-based sites, for example. On top of that, Joomla also includes multilingual support out of the box. That means you don’t need to use plugins or extensions to add more languages to your site. Finally, Joomla also enables you to use multiple templates or themes at once, for different types of content. Offers excellent support for custom post types. Provides advanced user management options. Includes multilingual support out of the box. Supports using unique templates for each page type. In paper, Joomla sounds amazing, and it is a strong pick. However, it’s not as beginner-friendly as WordPress, so it may take you longer to learn how to run a website using this CMS. It also doesn’t offer as many extensions or templates as some of its competitors. That’s not necessarily a dealbreaker, but it does mean that there are some features you may need to implement manually, making this a good fit for those who have modest development experience. Drupal is another name that carries a lot of weight in discussions about the best open source CMS. While it lags behind WordPress and Joomla in market share, that doesn’t make it any less notable. In practice, Drupal shines in a lot of the same areas Joomla does. For example, it offers a very flexible system for dealing with custom post types. It also gives you a high degree of control over your users and their permissions, and it can even handle multilingual sites out of the box. However, there are other areas where Drupal is in a class of its own. Its taxonomy system, for example, is much more powerful than its competitors. In addition, Drupal is considered to be a more secure platform than both WordPress and Joomla. Offers a flexible custom post creation and management system. Provides advanced user management and permission settings. Includes support for multilingual sites out of the box. Has a detailed taxonomy system. Boasts top-notch security for your website. You can build almost any type of website you want using the ‘big three’ CMS platforms, which include WordPress, Joomla, and Drupal. However, Drupal is renown for its scalability and security, which often makes it a better option for enterprise and business sites. It does, however, feature a steep learning curve. In most cases, we wouldn’t recommend that you use Drupal unless you have web development experience. However, if you are comfortable with development, this is one of the best CMS options available today. Now, we’re venturing into the realm of lesser-known CMS platforms. However, that doesn’t make these options any less valuable. It just means they have more specific use cases. Take Typo3, for example. This is a CMS with scalability as its main selling point, and it caters to enterprise-level websites. For example, if you want to use a CMS to build an intranet, Typo3 would be an excellent choice. When it comes to user-friendliness, on the other hand, Typo3 isn’t usually a first pick. In our experience, this CMS is best suited to users who have some experience when it comes to web development, and it’s not a great fit for smaller, simple websites. However, Typo3 does pack a lot of cool features, such as multilingual support. It also enables you to run multiple sites from a single installation, which can save you a lot of work. Is a great pick for enterprise-level sites. Includes support for multilingual websites. Lets you manage multiple sites from a single installation. Makes it possible to share data and tools among your websites. All in all, we’d recommend that you use Typo3 if you need to manage several sites that fall under the same umbrella. With this CMS, you can share templates, extensions, and even users among your sites, which is something most other platforms don’t support. In contrast to our previous pick, Serendipity is a user-friendly CMS that’s perfect for small blogs. In our experience, it’s one of the most lightweight CMSs you can use. That is not to say it’s lacking in features, however. Instead, it offers excellent performance for most websites, due to its built-in dynamic caching settings. When it comes to functionality, you can extend what the platform can accomplish using themes and plugins. Moreover, you can look for front or back-end specific plugins, which makes finding the tools you want simpler. Is perfect for performance-oriented websites. Provides access to a large selection of themes and plugins, to help you customize your website. Overall, Serendipity is a perfect option for small websites. It also makes setting up simple, elegant blogs a walk in the park. However, it lacks a bit in firepower if you’re interested in more ambitious projects. Personally, we’d recommend it if you’re looking for something that’s not as complex as WordPress or Joomla, and is very quick to learn. Dotclear is another excellent CMS option if you’re looking for a straightforward blogging experience. Among all the CMSs we’ve tested, few are as easy to use as Dotclear. Despite that, the platform features an editing experience that’s very similar to what WordPress offers. With Dotclear, you get access to a robust set of post publishing, management, and taxonomy options. The platform enables you to write your posts in plain text, HTML, and even Wiki syntax. Aside from those basic features, Dotclear also enables you to generate RSS feeds. Plus, you can add new functionality to your site using plugins and themes. Is very simple to use and set up. Supports plain text, HTML, and Wiki syntax. Lets you easily generate an RSS feed for your site. Ultimately, we’d place Dotclear in the same category as Serendipity. It’s one of the best CMS platforms you can choose if you want a simple blogging experience. Plus, either one includes all the options you’ll need to launch a successful project. Which one you choose will simply come down to personal preference. Next up, ImpressPages is a little-known CMS. However, it provides one of the best blogging experiences we’ve seen so far. Its editor is clean, and it features a modern interface. Plus, it enables you to add some elements other CMSs don’t – at least without extensions – such as maps and forms. Blogging and editing aside, this CMS scores high points across the board for design. Its dashboard looks modern, is easy to use, and provides you with a lot of options to customize your pages and your site’s functionality. ImpressPages is an excellent option if you’re looking for a CMS with an interface that doesn’t feel like it got stuck in the last decade. It also includes an intuitive drag-and-drop builder out of the box, so creating the pages you need is simple. On top of that, you can customize the CMS using plugins and themes. Despite its many pros, however, ImpressPages can’t compete with the likes of WordPress when it comes to the sheer number of extensions. That means creating websites with custom functionality can sometimes be more difficult. Offers a simple and modern interface that’s easy to use. Includes a powerful editor with advanced functionality. Lets you create content easily using a drag-and-drop page builder. Provides access to a decent selection of plugins and themes. In our opinion, this little-known platform is the best CMS you can use if you want to create simple landing pages, or if you value ease of use very highly. Last but not least, let’s look at Chamilo. This platform is different from everything else we’ve seen so far because it’s geared towards a particular type of website – learning platforms. In fact, Chamilo is what’s called a Learning Management System (LMS), which is a specific kind of CMS. With Chamilo, you can create online courses that range from simple to highly complex. Your classes can include text, multimedia elements, and multiple choice questions, and you can even set up assignments. If you’re looking for a CMS that will enable you to dole out homework, then look no further. Comparing Chamilo to the other CMS options we’ve reviewed so far wouldn’t make much sense since this one has a completely unique use case. However, suffice it to say that Chamilo holds its own when it comes to ease of use. It’s a great option if you need a platform that can handle multiple teachers, and it provides you with the tools you’ll need to create excellent online lessons. Offers a powerful platform for creating online courses. Enables multiple teachers to work side by side. Lets you create quizzes, conditional questions, assignments, and other learning materials. The only downside to Chamilo is that development for the platform isn’t as active as with the other CMS options we’ve seen so far. However, there’s a strong user community in both Spanish and English for this LMS, in case you need help getting started. Choosing which CMS to use is about as personal as picking an Operating System (OS). All the best CMS options have their supporters and detractors, but you don’t want to make a decision lightly. Personally, we’re partial to WordPress due to its ease of use and high level of customization. However, your mileage may vary, so we recommend that you test out more than one CMS before settling down with your favorite. What do you think is the best CMS in 2019? Share your thoughts with us in the comments section below!